I'm not sure why I decided to make this salad but probably because I had a craving for Thai food. So it was with this in mind that prompted us to visit the Thai supermarket at Golden Mile Complex. Besides housing a supermarket, this complex also has small eateries, travel businesses, money changers, hair saloons and other small establishments that cater to the local Thai community. There is a particular eatery here which both my husband and I really like because they do a very good Thai beef ball noodle. 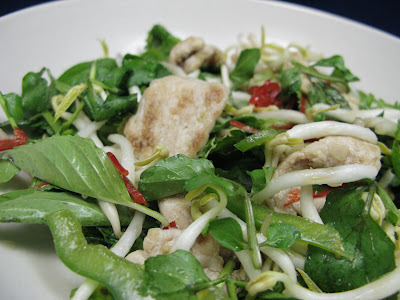 Their other scrumptious dishes includes phad thai, som tam (spicy mango salad) and minced chicken fried in spicy basil. This is a really simple and hardly takes long to put together. It's also full of flavours due to the amount of herbs and garnishing used. 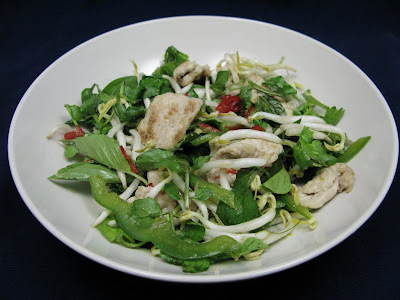 You can opt to have this as a light lunch or alternatively serve it as a side salad. 1) Cut pork fillets in half horizontally. Combine sugar, rind and oil in large bowl. Add sliced pork and toss to coat in mixture. Cook pork in batches in a heated lightly oiled frying pan over medium heat for about 15 minutes, or until cooked. 2) Meanwhile, place kaffir lime dressing ingredients into a screw top jar and shake well. Alternatively you can mix everything into a bowl. Adjust to taste. 3) Place pork in large bowl with remaining vegetables and herbs. Add the dressing and toss to combine. Serve as a side dish or a light meal. This recipe sounds awesome with lovely combination of ingredients.Looks delicious.